Hello! 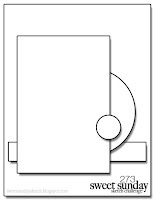 Today I am a bit square.....a square card that is. 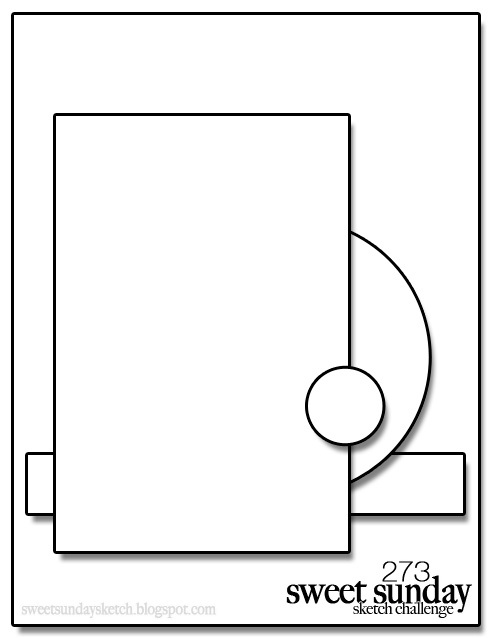 I make very few square designs but sometimes the image dictates to be square and a bit bigger too. So I made this card 5.5"x 5.5" to best show the lovely image from Power Poppy's Countryside Bouquet Deluxe. The card was made with challenges in mind for a sketch, color combo, and use of pencils. The Bouquet was stamped with Memento Tuxedo Black ink on White CS and colored with Koh-I-Noor Pencils and OMS. I heat embossed a bit of Wow Yellow EP on the center of the White Flowers and a bit of Ranger White EP on the petals of the same flowers. This gave some texture and shimmer on the bouquet. I trimmed the image with Lawn Fawn Stitched circle die. 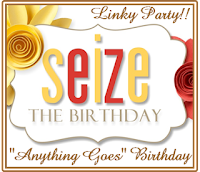 The card was completed with a Gray Card Base, 3 strands of Yellow Satin Ribbons, and a sentiment from Power Poppy Lavender set. I really am pleased with the results. Hello! 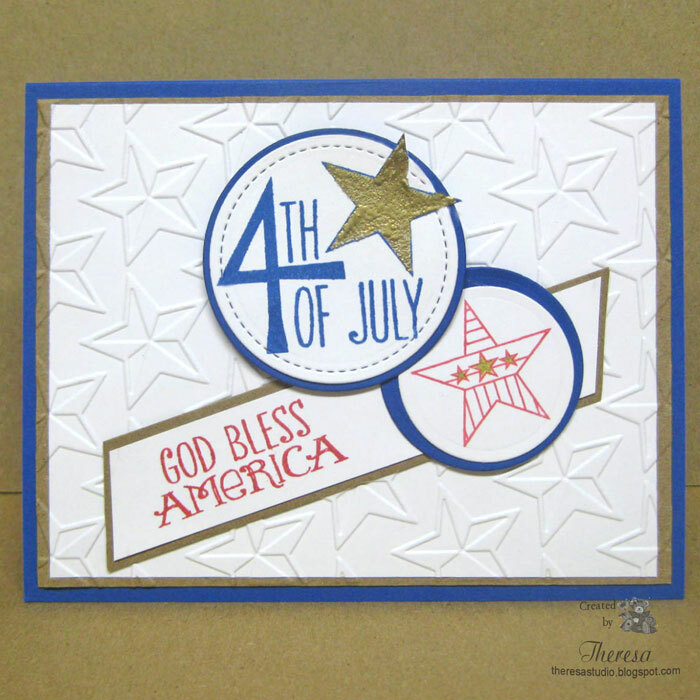 I am still thinking about the upcoming holiday and making cards with a 4th of July theme. 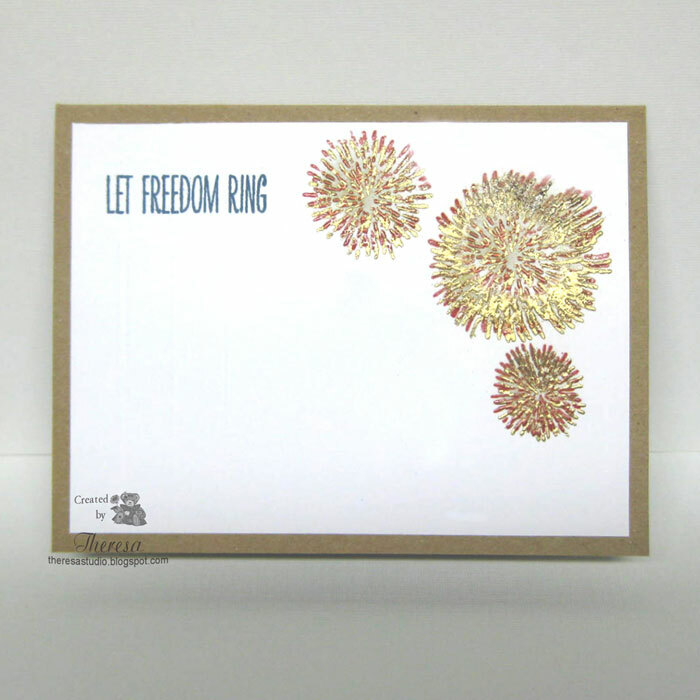 For this card I used a Fireworks stamp from Repeat Impressions and a Sentiment from Verve's American Hero. I heat embossed the Fireworks with Red and Gold EP's and stamped the sentiment with Memento Blue ink on White CS and placed on Kraft base. 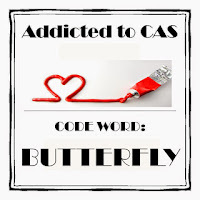 I used the sketch below but gave it a turn for making this CAS card. 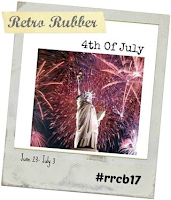 Retro Rubber Challenge: #17 Fire It Up! Use 4th of July as inspiration. Stamps are definitely older ones. Hello! 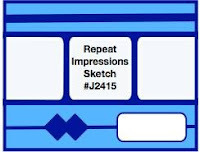 Today I am playing with a sketch that has a vertical sentiment and I have some great vertical sentiments from Repeat Impressions and chose to use the Birthday one. I combined this with a stamp from Power Poppy's Countryside Bouquet set that I stamped with Memento Espresso Truffle ink on Ivory Textured CS and colored with Markers. To make the petals show up very white, I used a Versamark pen and embossed them with White EP. 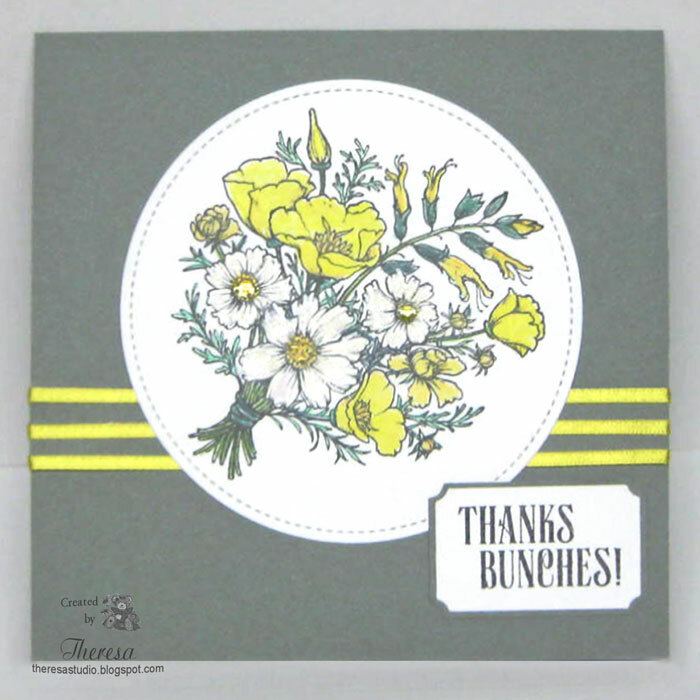 Also embossed the yellow center with WOW EP California Sunshine. The flowers really look great in real life. The sentiment is in SU Always Artichoke ink and the base is GKD Fresh Asparagus CS. Hello! How quickly June has gone. We will soon be celebrating the 4th with picnics, cookouts, parades and fireworks. 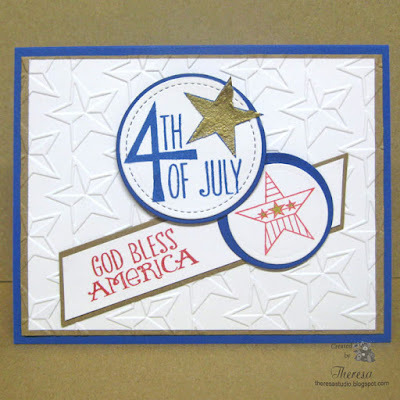 I pulled out some old Verve stamps from American Hero set to create a Patriotic card for the upcoming holiday. I used SU Brilliant Blue, Kraft, and White cardstocks with Memento Love Letter and Danube Blue inks, Nesties Circle Dies, Lawn Fawn Stitched Circle Die, and Cuttlebug EF Stars. I heat embossed the Star with Gold EP. 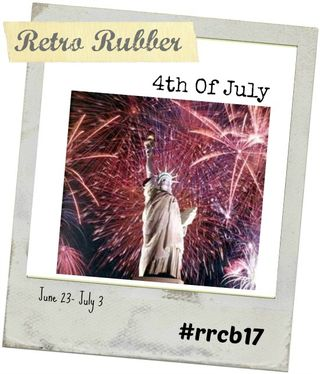 Retro Rubber Challenge: Challenge 17 Get Fired Up! Use 4th of July as Inspiration. Verve Stamps were won a few years ago. What are your plans for the 4th? Have a safe holiday. Hello! Looks like another cloudy day in Ohio. May be no end to the rain for a few days. I thought I should share a sunny card to celebrate Summer. 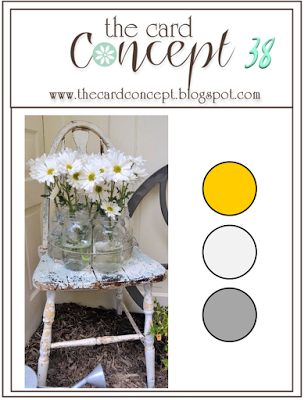 I used some Heartfelt Creations stamps Daisy Patch Flowers and Bouquet and a Ball Jar to create. The images were stamped with Memento Espresso Truffle ink and colored with Copics. I stamped, colored and fussy cut 3 of the flowers and popped up. 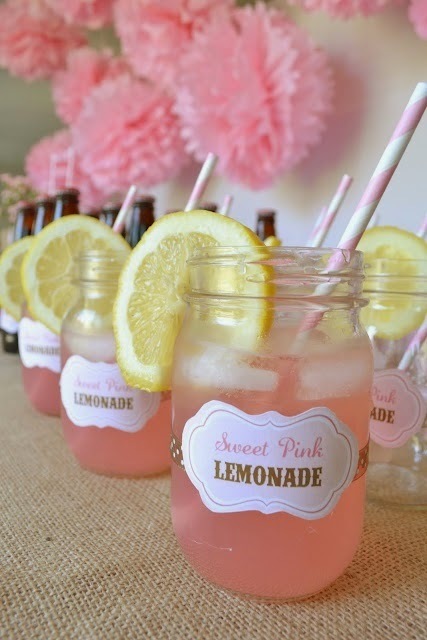 Using a mask I stamped the Jar with Versamark and embossed with clear EP and colored with a light pink Copic. The Repeat Impressions sentiment was heat embossed on Pink Vellum with Pearl Embossing Gold EP and placed over the image. I used a Yellow CS base and a layer of Pattern from Pink Paislee Color Wash pad. My colors and design were inspired by the photo at The Shabby Tea Room Sweet Summer Challenge shown on the right. 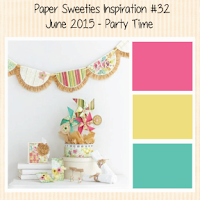 Paper Sweeties Inspiration Challenge: #32 Party Time. 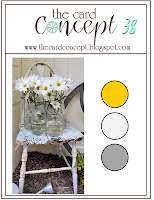 I used the flowers and colors as inspiration. Craft Your Passion Challenge: Always Anything Goes. Hello! Another rainy morning in Ohio. Not a good day for shopping Farmer's Markets, gardening, or playing at the pool. So what is a girl to do?? Play in the Studio and make cards? That sounds good to me. 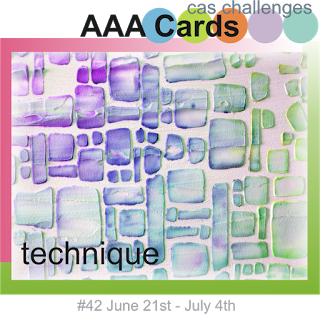 I am sharing a Single Layer/One Layer card made for some challenges. And I again used some stenciling done with another Spellbinders Impressabilities called Seascape. 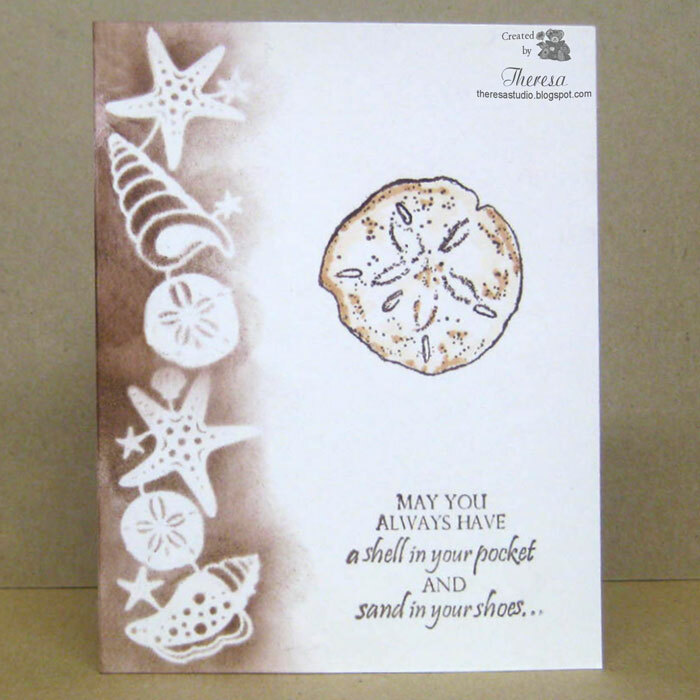 I used Memento Rich Cocoa ink, GKD Ivory CS, and GKD stamps Gifts From the Sea by Melanie. 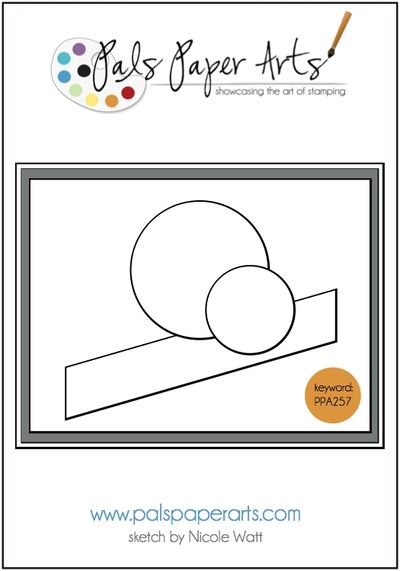 Stamp TV Release Challenge: STV615 Release...make a single layer card. Hello! I have been playing with some Repeat Impressions Stamps and some Patterned Paper from Crate Paper to create this card for the What If? Wednesday sketch challenge J2415 at The House That Stamps Built shown on the left. I used 3 of the Bear stamps from Repeat Impressions. 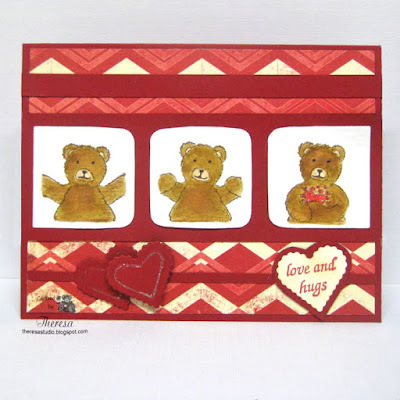 Hugs Flip set and part of the sentiment stamp from the same set. The Bears were stamped with Memento Rich Cocoa on watercolor paper and water colored with Distress inks. I just happened to pick up a scrap of water color paper, no other reason that I did with watercolors. Other supplies: Red CS, Ivory CS, Spellbinder Heart Dies, Corner punch, Memento Rhubarb Stalk Ink, Red Marker, Clearstar Pen. Second post today! Trying to play catch up on challenges. Welcome to my studio! Stenciling is a technique that I have not used much mostly because I do not have many stencils. But, I had forgotten about some Spellbinders Impressabilities that I bought about 5 years ago....just had to have but I not used much. 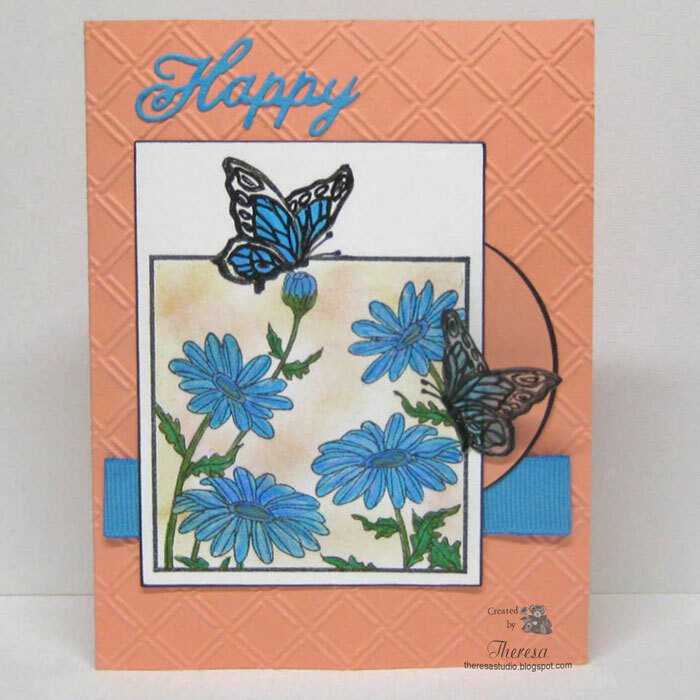 The Butterfly one (shown on right) that I used on this card I think I have never used. Stenciling seems to be all the trend. 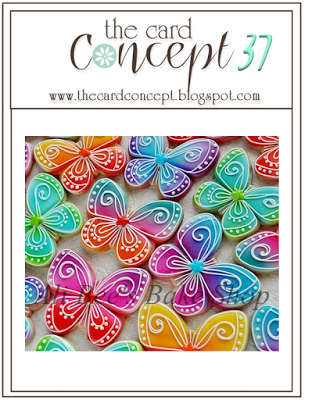 I stenciled a portion of the stencil on white CS with Tumbled Glass Distress Ink and then cut a Butterfly from the CS with Memory Box Pippi Butterfly Die . I attached the white layer to a Card base of Blue and then added the butterfly and words to finish this CAS card. The words were cut with Cheery Lynn Dies from blue CS. 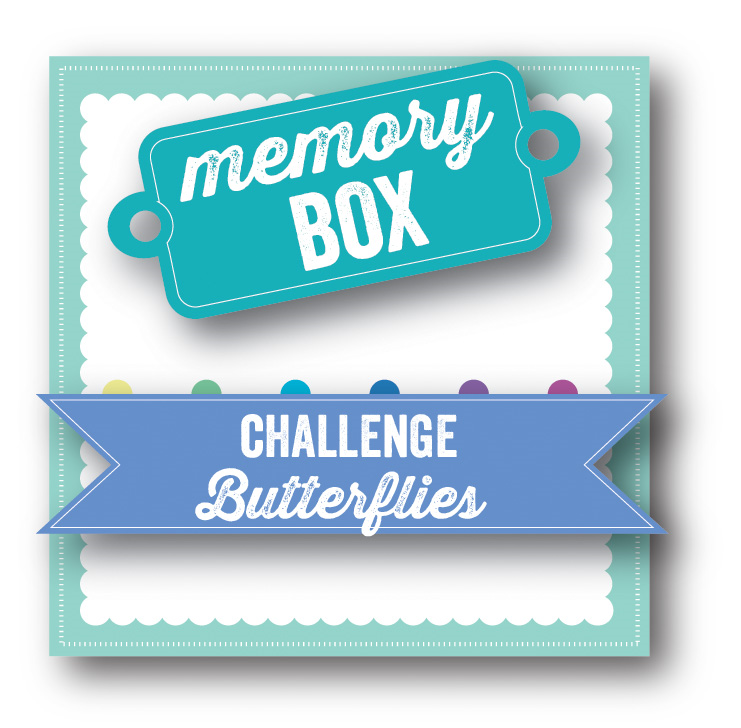 Memory Box Challenge: New monthly challenge. #1 Challenge is Butterflies. Used Memory Butterfly die. Hello! Thanks for stopping by. Today my card is made with a new stamp set from Power Poppy called Poppies. I stamped the image with Memento Espresso Truffle ink and colored with Koh-I-Noor pencils and OMS and used a Black Glaze pen on the center of the Poppy. I trimmed the edge and layered the image on Red Paper. The Black Background embossed with Cuttlebug EF Gingham and the striped panel are from Fancy Pants Trend Setter paper pad. The card base is GKD Tomato Soup. I finished with a sentiment in Memento Tuxedo Black Ink and a Black Satin Ribbon and Double Bow. 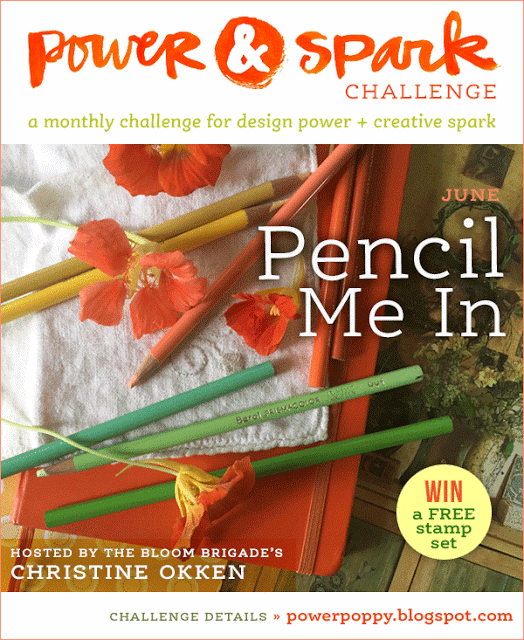 Power Poppy: Pencil Me In challenge. Hello! 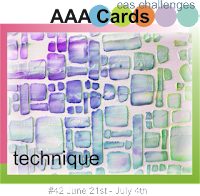 Today I have combined a Photo Inspiration Challenge and a Sketch challenge to create my card. 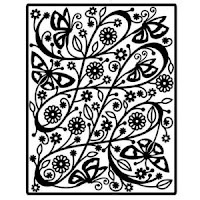 I began by stamping Repeat Impressions Daisies and Butterfly with Memento Tuxedo Black Ink and coloring with Copics and pencils and doing a bit of sponging on the image. I trimmed this with a Rectangle die and inked edges with Black Ink. I assembled this with a Coral CS Base with Blue Grosgrain Ribbon, Die Cut word Happy, Die Cut Circles, and a Butterfly stamped on vellum. 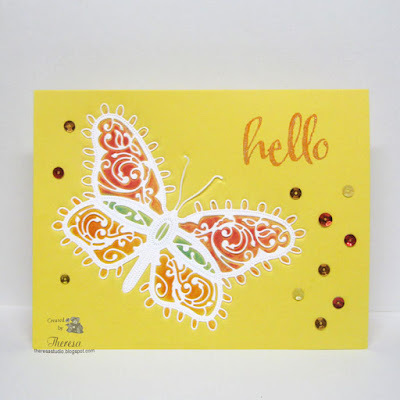 The Butterfly was stamped with Versamark and heat embossed with Black EP, colored with Copics and fussy cut. Also embossed card base with Cuttlebug EF Wicker Weave. The House That Stamps Built: WIW Photo Inspiration Challenge J1715 on right. 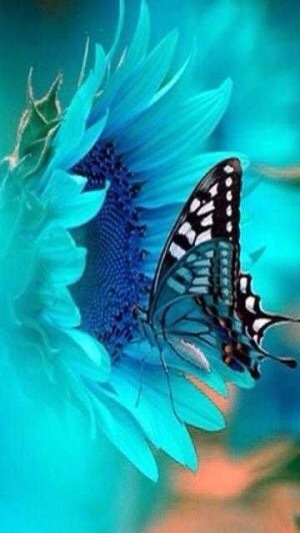 Used colors and theme of flowers with a butterfly from photo. Fusion Color Challenge: Use Sketch or photo or both. Graphic shown below. 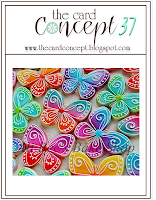 Inspired by butterfly and colors. Hello! I am still fluttering with butterflies. Today I have used the sketch from CAS(E) this Sketch for my design. I chose pattern papers from Our Daily Bread designs Shabby Rose Collection to go with a Butterfly cut lightly and embossed with a Cheery Lynn Butterfly die from pink Vellum. I layered this over another butterfly cut with CL Angel Wings die from Pink CS. 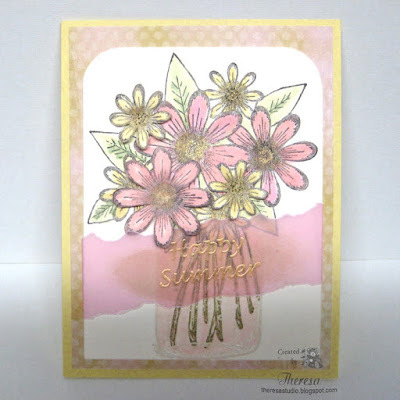 I embossed the background pattern with CB Wicker Weave EF that I attached to Pink card base. The Cheery Lynn Thank You dies were cut from Green CS, Pink CS, and Pink vellum that I stacked and glued together for depth. CAS(E) this Sketch: See sketch on right. I did a very close interpretation. 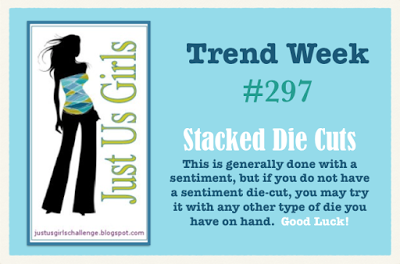 Just Us Girls: Trend Week #297- Stacked Die Cuts. I stacked the sentiment as well as the butterfly. Butterfly Challenge: #33 Butterfly + F for flowers. 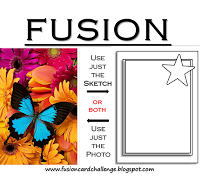 The challenge is always Butterflies but with the addition of an item/ theme beginning with a chosen letter. I am still playing with butterflies! I was not sure that I liked this card until I saw it in the photo and now I do like it. 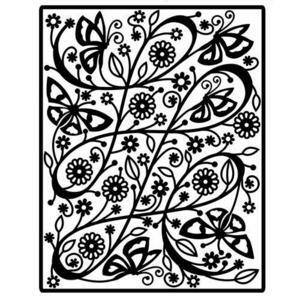 The card is a larger size (5.5"x7") than I usually make in order to best show the butterfly which I cut with Cheery Lynn Lace Flourish Butterfly die that is 5.5"x3.5". 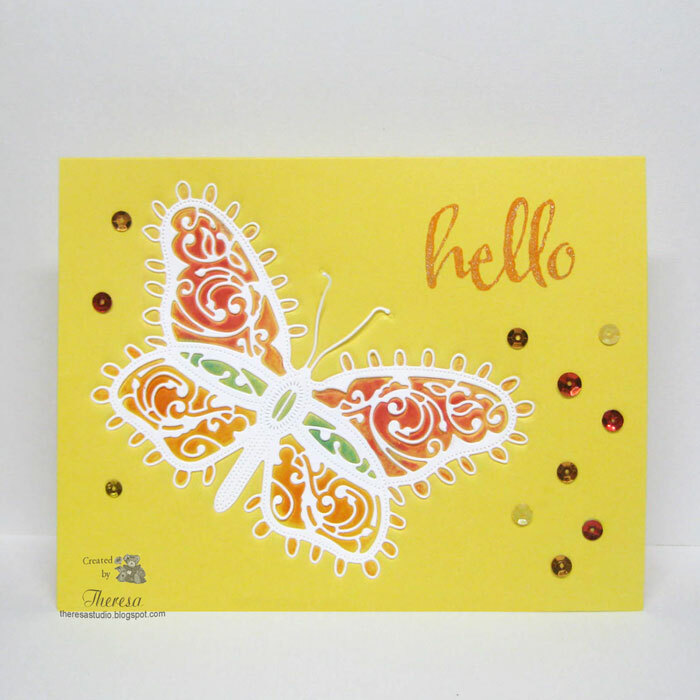 To make this design, I embossed the Butterfly on Yellow CS with the die and then colored areas of the embossed image. 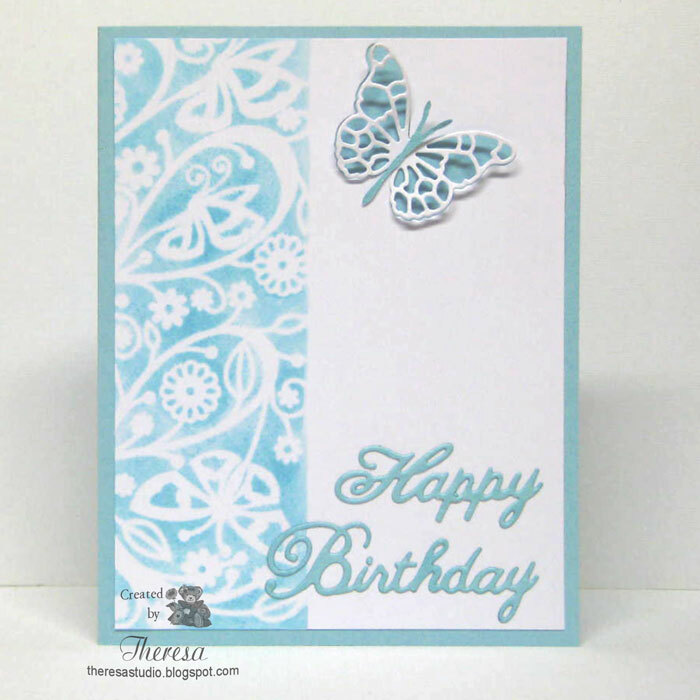 I then cut the butterfly from White CS and attached it above the embossed one. This called for a Bold sentiment so I stamped a Winnie & Walter bold Hello with Memento ink and added some Clear Star pen for shine. Finished with assorted sequins from my stash. 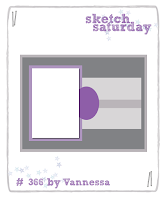 I think this would qualify as a One Layer Card? Butterfly Challenges: #32 Butterflies + S for Sequins. This is a new challenge to me and first time to enter. 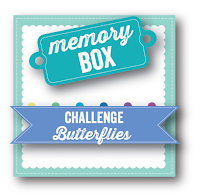 The challenge is always Butterflies but with the addition of an item/ theme beginning with a chosen letter. 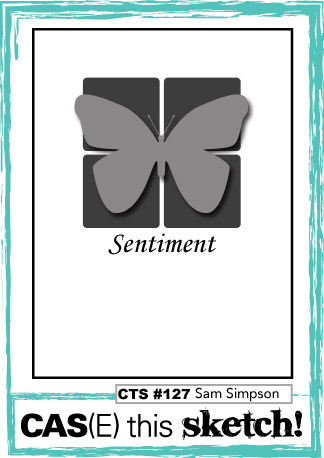 The Card Concept : #37 Butterfly Effect. I consider this Clean and Simple. Hello! 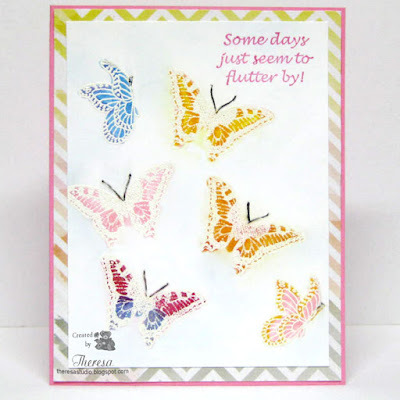 Today I have been playing with Butterflies...on a card that is. Using 2 butterfly stamps from Repeat Impressions, I did random stamping with Versamark on a white CS and heat embossed with white EP. I used Memento markers to color ...not sure if I really like the choices but was just playing and experimenting. Finished with a frame of Pattern Paper from Pink Paislee Color Wash Pad and a base of Pink CS. 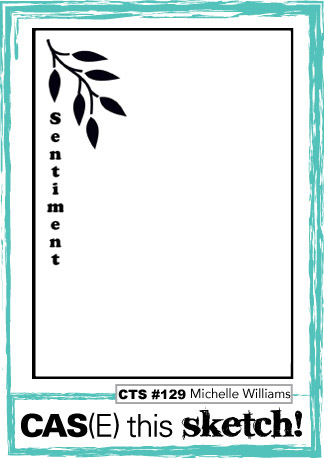 Sentiment also from Repeat Impressions stamped with Memento Rose Bud Ink. 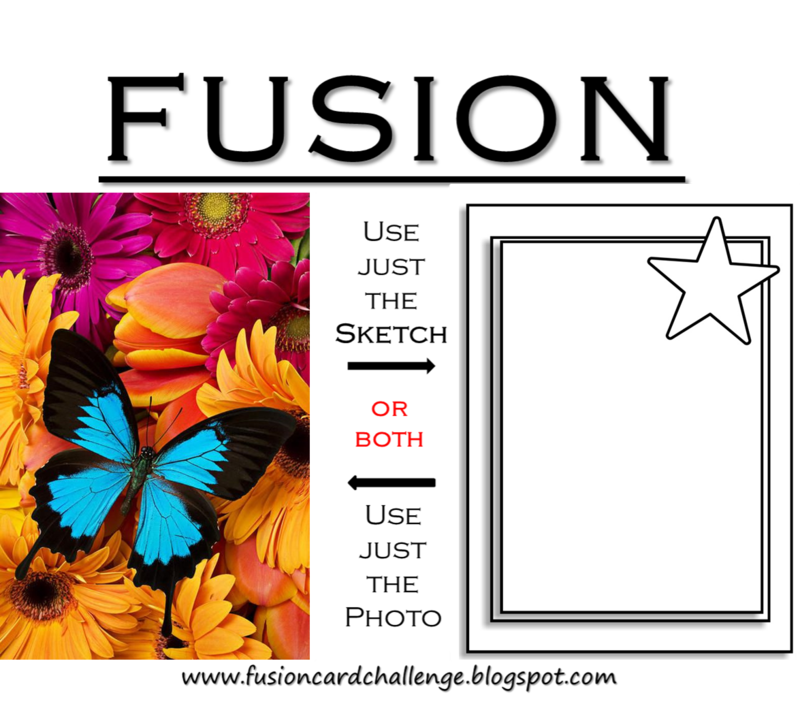 The Card Concept: Challenge #37 Butterfly effect. 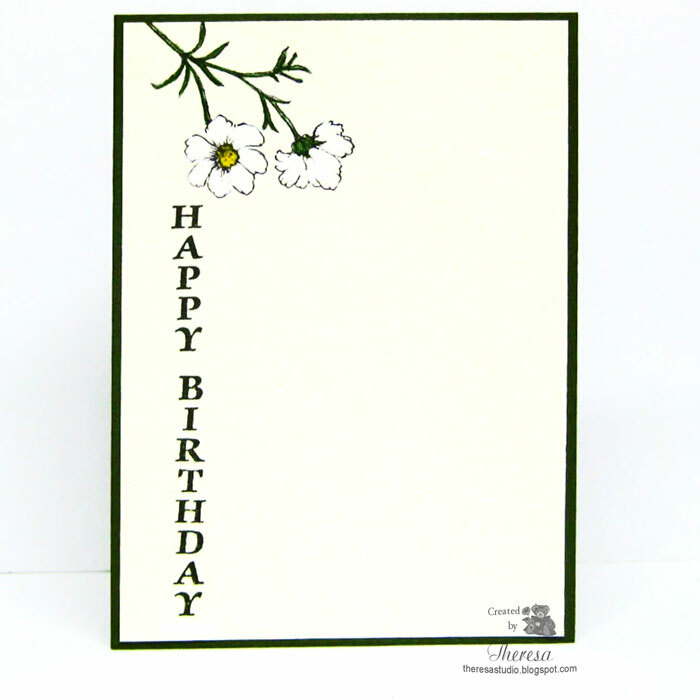 Used graphic on right for colors and white embossing. I would call this style Clean and Layered. Hello! 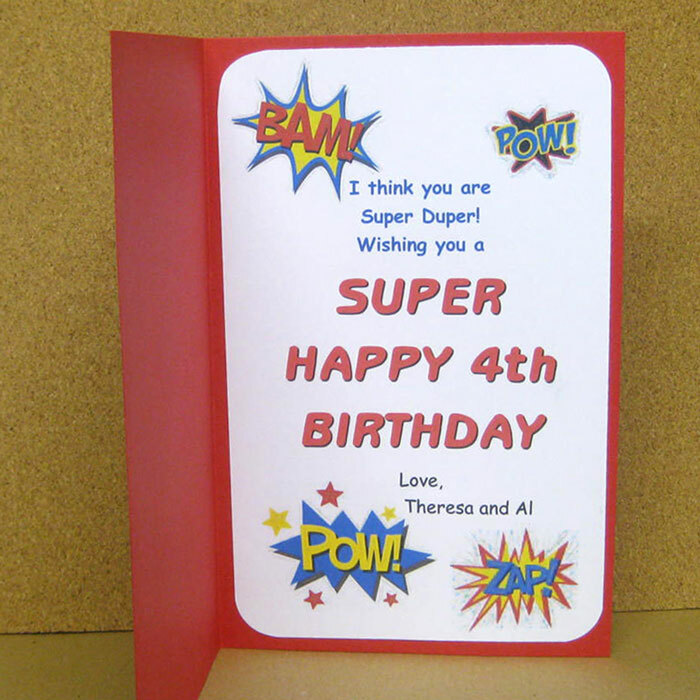 Today I have a fun card that I made for my great-nephew who celebrates his 4th Birthday this week. 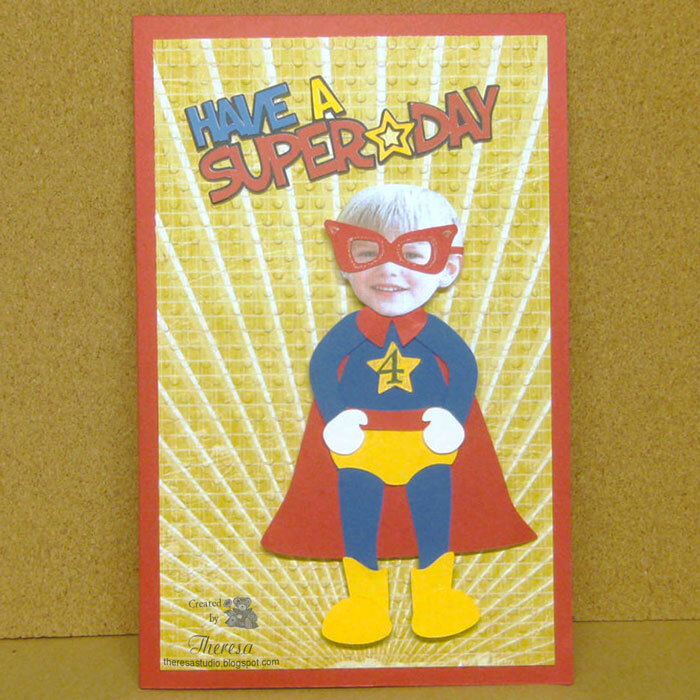 He is such a super little boy that I had to make him a Super Hero Card. I used Silhouette files and my Cameo to cut out the Super Hero Boy and Sentiment. I used Photoshop to print Jacob's face to personalize his card. I used a Crate Paper pattern as the background for the image. I hope he thinks this is a Super card! Craftyhazelnut's Patterned Paper Challenge: Always about pattern paper.